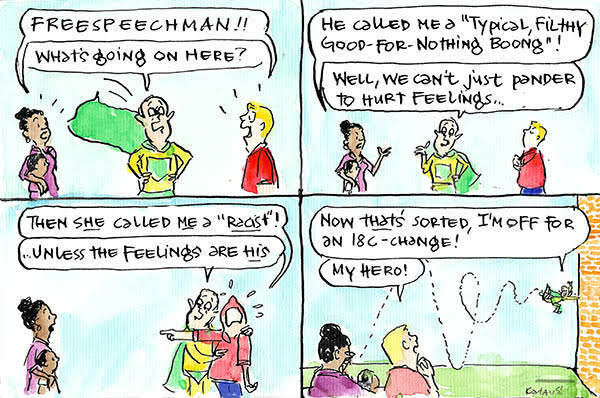 Freespeechman needs a new script (amongst other things). Interestingly, the word "boong" is the aboriginal word for "white man" in the Eora dialect. The Eora people lived on the south side of Sydney Harbour and when Cook landed, the Aborigines, so some accounts acclaim, stood around in curious groups pointing at the new arrivals saying "boong". The landing parties adopted this name not knowing its meaning to describe the Aborigines. Those Aborigines who understandably don't like to be called boongs are objecting to being called white men. Perhaps to many today, the local dialect has sadly been lost, like so many other Aboriginal dialects. I treated many Eora people during my professional life and an elder told me this. The famous Charles Perkins was also a patient of mine and confirmed the meaning to me. Considering the quality of a lot of white men today it is no wonder the Aborigine's object to being called boongs.